Swap the boats for computers and it begins to look familiar. Happening this week in London is one of the largest edtech conferences in the world, one that many educators in the US have probably never heard of. It’s called BETT1 and the organizers say it will attract almost 35,000 attendees. 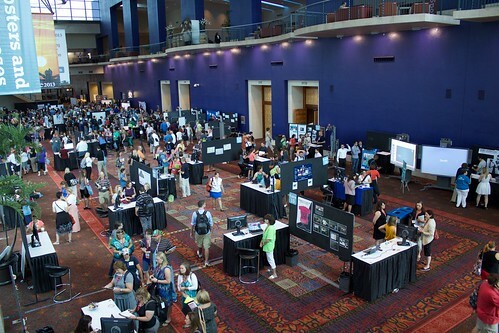 For comparison, recent ISTE2 conferences, largest in the US, have included around 22,000 people. Also happening this week in Orlando, Florida is another large edtech conference, one that is probably quite familiar to anyone reading this, FETC3. They usually attract around 8,000 people. So, big but not nearly the size of the other two. All three edtech organizations, of course, want us, the common educator, to believe that the event will provide hundreds of professional development opportunities. Ones that address the “future of education” and “transforming education” (in the case of BETT). Several days that will be an “intensive, highly collaborative exploration of new technologies, best practices and pressing issues” (FETC). That will offer “powerful ideas and inspirational speakers, while connecting with innovative educators who share your passion for transformative learning” (ISTE). However, a large and growing part of these huge conferences is the vendor floor. I would argue it’s the largest, and likely most important, part to these three organizations. Companies pay big bucks to have a presence at these events, even more for a high profile sponsorship, money necessary to keep their budgets in the black. BETT at least is up front about primarily being an industry trade show, rather than a professional development conference. According to it’s about page, this is the “first industry show of the year in the education technology landscape”. ISTE and FETC are more circumspect on the issue, but their literature still places a heavy emphasis on the number of companies that will be exhibiting at their events. Ok, I’ve never attended BETT or FETC, and, based on their online programs, I really have no desire to go. (Although I wouldn’t mind visiting London. Anytime.) On the other hand, I have been to ISTE many times (over almost twenty years) and the attraction for that event has been declining. Don’t get me wrong, I’ve always felt my trips to ISTE were worth while, learning much during the time and always making or renewing some wonderful connections. And almost none of that came from visiting the “massive Expo Hall”. I expect that the same would be true if I was at the big events in London or Ontario right now. But I find that it takes more and more work to find those professional benefits at these overly-large conferences. Considering the number of people I see spending hours in the vendor hall and flocking to the “Cracker Jack” sessions, along with the volume of social media posts about the “cool new” stuff, I’m not sure that’s happening at all for a large percentage of those tens of thousand attendees. On top of that, the dominance of the edtech industry has steadily grown at these conferences. Large parts of the formal program at ISTE and FETC are now presentations by corporate representatives and sessions by educators sponsored to some degree by those companies. Extending their marketing reach beyond the one hall. All of which is making these huge conferences more resemble the classic boat show than an education event. The title for this post is borrowed, with thanks, from Gary Stager. It’s just such a wonderful name for the massive and increasingly flashy vendor floors of these events so I hope he doesn’t mind me using it. The picture is from the Detroit Boat Show. 1 From the original name the British Educational Training and Technology Show. 2 Anyone else see something wrong about an organization with “international” in it’s title that’s never holds it’s major event outside the US borders? Sorta like the “World” Series. 3 Which started life as the Florida Educational Technology Conference. It was changed to the Future of Educational Technology Conference when the event was purchased by a media company that operates many other business conferences. Approaching the end of another calendar, the inevitable (and lazy) flood of year-end recaps and forecasts for some undefined future is beginning to trickle in. At this point, America’s education system finally has all the key building blocks in place: The infrastructure is solid, almost every student has a device and wireless internet access, schools and educators (at all levels) are now much more comfortable working with technology and data, and thousands of entrepreneurs are working—not just with early adopters, but increasingly with early mainstream schools and educators—to bring edtech and personalized learning to the masses. This is why I’m optimistic about the next decade of educational technology and innovation. I can’t wait to see how the next chapter unfolds! Start with the statement that the “infrastructure is solid” in schools. It’s true that the vast majority of US classrooms are connected to the internet. But the number with adequate bandwidth is much, much lower, especially in high poverty rural and urban areas. Even worse is his claim that “almost every student has a device”. I suppose if you average out everything, it might be close to 1:1. But even if you can claim a 1:1 ratio in your school/district, that doesn’t mean every student has the same quality of device1. Or can accomplish the same quality of work with the equipment and software available. That’s true even in the very rich overly-large school district that used to employ me. Finally, there’s the line about educators being “much more comfortable” using technology and data. I’m pretty sure most teachers are “comfortable” with the tools they use. The digital grade book, attendance systems, Word. Most are not at all comfortable with tools for meaningful learning, especially when it’s students using that technology in creative ways. However, all of that really doesn’t matter. When it comes to being optimistic about educational technology, this particular column is not at all about student learning or even teacher productivity. The writer is a “general partner” at a venture capital firm, one that specializes in “disruptive education” startups. His optimism is all squeezing as much profit as possible from the education technology companies in which they’ve invested. Profit which will ultimately come from schools and districts at the expense of other priorities. After all, there’s a bear market in all that “personalization” and data collection. 1. A Chromebook is NOT a computer. Don’t tell me otherwise because I’ve used both and Chromebooks do not compute. But that’s a rant for another day. In a podcast discussion with Will Richardson following the ISTE conference, Bruce Dixon made a comment about the need for organizations and conferences like ISTE that has stuck with me. We always used to say when we had our computer using groups… we’d be successful when we’re no longer needed. And I’m not saying that necessarily ISTE isn’t needed any more, but I do think that half of what it’s doing is trying to strive to hang onto everbody that it has, rather than trying to build towards it’s extinction. Because if all the professional associations were so embedded with their use of technology that there wasn’t a need for this specialist organization, I think they should see themselves as a success. It’s very sad when it’s main reason for being is a conference and a vendor floor, and not enough to do with learning. The poster session at an ISTE conference. For many years, as I reflected on the trip home from ISTE and other conferences, I’ve often had the same thought. Was that event was worth my time, effort, and money? Should we even be holding special meetings that emphasize technology? However, another reason why Bruce’s comment and the whole issue of the need for edtech conferences really sticks with me is that I am part of the problem, so to speak. I’m on the planning committee for the annual conference presented by our state ISTE affiliate, VSTE1The Virginia Society for Technology in Education and we are just now gearing up for the event coming up in early December. To the general question of whether edtech conferences have any validity, I think they still do, although I agree that we may not be working hard enough to put the organizational “edtech” establishment out of business. For me, this has nothing to do with the vendor floor and only tangentially with the conference program. The value in any meeting like this, big or small, comes from the gathering of many smart people in the same place, and the opportunity for face-to-face discussions. I’m probably old fashioned in that way, but social media and other digital communications have many limitations in their effectiveness to convey ideas. I worry about many of the people who attend ISTE, VSTE and other educational conferences. They miss many of those opportunities by spending large amounts of time with the marketing people, where most of the conversations are more about selling products than about improved learning. They also spend too much time sitting in sessions. I realize formal sessions are the core of most conferences, with the keynote speakers often being a major drawing card for attendees. But those lectures are, with rare exceptions, very one-way relationships. So, for those of us who will be assembling the various parts of our state conference, we have a challenge. To make the time spent by our members both valuable and interactive. Listening, so we can help them connect with new people and ideas, rather than telling them what is important and “hot”. And to work harder to make the whole event, and the supporting organization, unecessary. Is that like heresy? 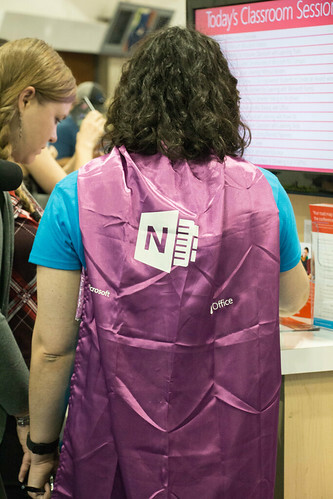 Do I have to return my edtech geek badge? In an earlier post, I offered my impressions of a New York Times article about teachers who are acting as “brand ambassadors” for edtech companies, sometimes for real compensation. Many of the people in my Twitter feed offered far more critical and pointed comments about this practice. And the edtech industry in general. The Times piece is one part of an irregular series called Education Disrupted,2My take on an earlier entry about Google is here. written by a tech reporter working in the business section of the paper. And, in a follow up to the longer article, the writer reflected on the reasons why she finds reporting on the influence of technology companies on education so “riveting”. Her parents and grandmother were all educators and she has some experience teaching summer courses in “tech-innovation ethics” to high school students. All of which gives her some credibility for me. Her thoughts from the end of this reflection adds a little more. Given that students get only one chance at a free public school education — an undertaking with huge implications for their economic prospects and life of the mind — it behooves us to examine Silicon Valley’s effects on the classroom. I just hope she and others will continue to ask “prickly” questions of those companies who want a high profile in school classrooms. So, teachers. Most of you have one chance with the students in your classes this year. Can you do your best for them and still sell interactive whiteboards on the side? From the New York Times, a high profile story about how edtech companies are recruiting teachers as “brand ambassadors” to promote their products to schools and other educators. Ms. Delzer is a member of a growing tribe of teacher influencers, many of whom promote classroom technology. They attract notice through their blogs, social media accounts and conference talks. And they are cultivated not only by start-ups like Seesaw, but by giants like Amazon, Apple, Google and Microsoft, to influence which tools are used to teach American schoolchildren. Their ranks are growing as public schools increasingly adopt all manner of laptops, tablets, math teaching sites, quiz apps and parent-teacher messaging apps. The corporate courtship of these teachers brings with it profound new conflict-of-interest issues for the nation’s public schools. I’m not really sure the Times has discovered anything new. Google, Apple, Smart, and other tech companies have had “certified” educator programs for many years. Look around any education-related conference like ISTE and you’ll find many sessions presented by Google Certified Educators or Apple Distinguished Educators. Some of the same speakers also show up at company booths in the vendor hall. I know many of those educators, and few are receiving significant compensation, if any, beyond maybe a t-shirt or some basic tchotchkes. Most enthusiastically use the products they demonstrate at conferences and other professional development, motivated by wanting to share their successes with their colleagues. But then there are also the high profile edtech “rockstars”. The ones who are featured speakers at conferences, who have tens of thousands of followers on their websites and social media, get quoted in the edtech press, and who are constantly promoting the products of a particular company. What’s rarely made clear is their relationship to the company. Anyway, the bottom line to this story is the question of whether teachers who promote a particular brand or product to their peers, regardless of any compensation, are breaching ethical standards or even violating local and state laws. Can you promote a specific device, piece of software, or web service and still remain objective in deciding which tools will work best for your students? I don’t know. The comparison made to similar relationships between doctors and the pharmaceutical industry could be far too close. By the way, near the beginning of the article, the writer includes one sentence that I think deserves far more attention in the whole discussion of the use of technology in the classroom. Moreover, there is little rigorous research showing whether or not the new technologies significantly improve student outcomes. A topic for another rant on another day.